Friday, 7:30 am: The alarm goes off and reminds us its time to get up, pack the car, and get on the road. Yes, we're driving to Florida from Michigan. Sure, it's almost 1200 miles and 18 hours of driving, but as former members of the long-distance relationship club, we enjoy long car trips. This was to be Alexander's first car trip, and at 19 months old, perhaps a bit of a challenge. 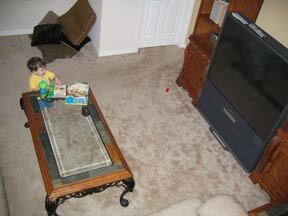 But we had a DVD player, books on CD, toys, and snacks, and were as prepared as we could be. Saturday, 7:00 pm: We arrive in Kissimmee, Florida after a stopover at Dave's brothers house for the night in Marietta, Georgia. Alexander came through our driving adventure with high marks! We stop at the All-Star Vacation Home office conveniently located down the road from our vacation home rental and pick up our keys and a map. Within minutes we're driving through the security gates (key code conveniently provided, of course) and into "our" driveway of 8009 Acadia Estates. We stepped inside (the lights had been left on for us) and found our home away from home was everything we hoped for and more. 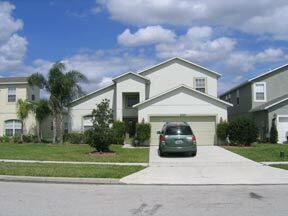 The house matched the floor plan, photos, and 360* tours offered at the ALL STAR Vacation Homes web site. We excitedly walked through the entire house to gawk at the game room (complete with air hockey, foosball, pool, and skeeball), the movie theater (seriously! 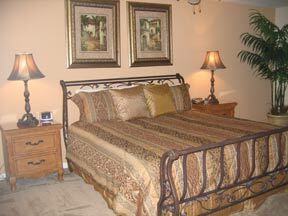 ), the pool and hot tub, and the five bedrooms. Alexander toddled around the house in glee, ecstatic to be out of his car seat after a long day on the road. After our tour, we went down the road for dinner at Pizzeria Uno, and then back to our home to put Alexander to bed. Dave went upstairs to get online and check e-mail with the provided Dell computer and wireless Internet while I made a beeline for the hot tub. Ahhhhh. Sunday, 9:00 am: Alexander wakes in his crib in the second downstairs bedroom and is ready to start the day. We'd brought along the appropriate baby accoutrements for this trip, such as a booster seat for dining, child safety gate, Pack 'N' Play, and outlet covers, so Jennifer set out baby-proofing while Alexander watched the Disney Channel on the 54" projection TV in the living room. 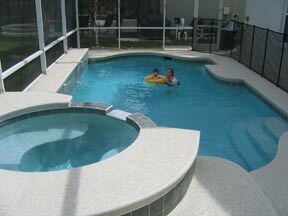 Baby-proofing was not overly difficult, and ALL STAR Vacation Homes have child safety fencing around the pool. The only challenge we faced was the lever-style door handles, as Alexander learned to open them easily. This cloud proved to have a silver lining, however, as Alexander also learned to knock on doors and ask "Who's there?" (albeit a bit mumbled) while he opened and closed these doors. (Note that you can rent items like booster seats, safety gates, and cribs through ALL STAR Vacation Homes by calling in advance. We got a crib through them -- it was already set up in the room of our choice upon our arrival and it was much higher quality than the sort you find in most hotel rooms.) After a good sleep, Dave went to this weekend's NFCC (National Fantasy Fan Club) Disneyana Show and Sale with our good friends Bruce and Marta Metcalf, where he hooked-up with many friends from the Disney community. 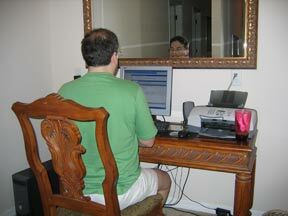 Jennifer stayed behind to go shopping at a nearby Publix, and stocked the house with foodstuffs. 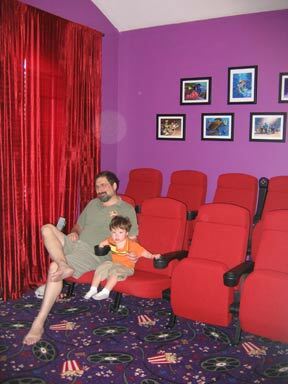 After the show, we all watched a DVD in our private theater with 65" DPL HD Screen with Surround Sound and tiered stadium seating. Yes, we're now officially being spoiled! Dinner tonight was at Boma, a short drive away at the Animal Kingdom Lodge. The ease with which we got there and back trumped staying on Disney property and using Disney bus transportation. 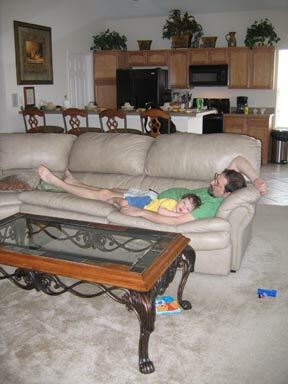 Monday: A truly lazy day was ours today. We took naps, watched TV, played games, and went swimming. Everything about the house made it perfect for relaxation. 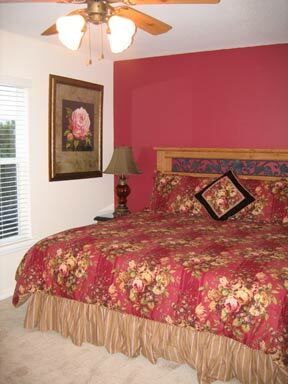 Jennifer particularly enjoyed her nap in the master bedroom, which has a sliding glass door onto the patio. She opened the door a crack and let the sound of the pool's waterfall lull her into a blissful nap. This evening's dinner was at Earl of Sandwich at Downtown Disney. On our walk through Downtown Disney, two PassPorter message board members spotted us and we stopped to chat for a bit. Dinner was great and quite economical - we also enjoyed our first real Disney visit of the trip. Tuesday: Another lazy day in the vacation house. Dave made another trip to Publix to shop for tonight's barbecue. The house has a full kitchen (refrigerator, stove, microwave, dishwasher, toaster, coffeepot, plates, flatware, utensils, pots, pans, glasses, and MUCH more), as well as a large gas barbecue grill in the yard. While the chicken was marinating in garlic, lime juice, mint and olive oil, Jennifer took Alexander to Downtown Disney for some fun on the carousel and some play time at the LEGO store. This evening our friends Steve and Vicki Barrett came over to share our barbecue dinner. 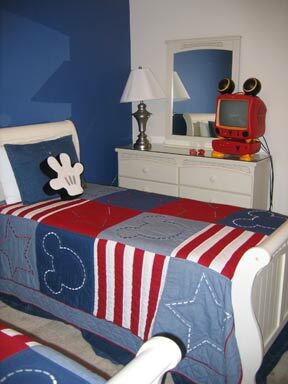 (Steve is the author of the popular "Hidden Mickeys" book.) The barbecue grill worked like a charm and we had a semi-relaxing dinner (Alexander was more into throwing his food tonight than in eating it). 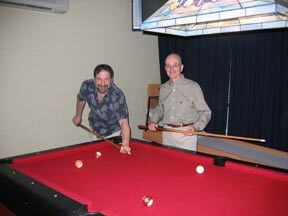 Afterwards, Dave and Steve messed about in the game room. 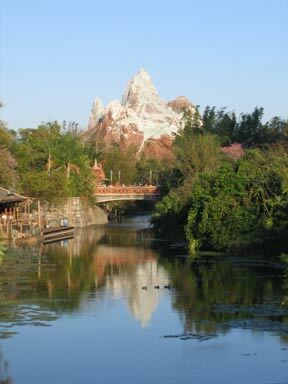 Wednesday: Expedition Everest at Disney's Animal Kingdom was calling our name, and we went to check it out. Thanks to our relaxed timetable, we didn't get to the park until noon and by then the FASTPASSes had all been distributed for the day. So we decided to ride around parade time when the standby lines would (hopefully) be shorter. In the meantime, Jennifer took Alexander to see Pocahontas in Camp Minnie-Mickey while Dave strolled around with friends Bruce and Marta. After a filling meal at Tusker House, Alexander conveniently fell asleep in his stroller and Marta watched him while Jennifer, Dave, and Bruce rode Expedition: Everest. The queue was simply amazing, with the same kind of detail and theming found at other Animal Kingdom attractions like Kali River Rapids. At one point the queue passes through a museum dedicated to the Yeti. We could have easily spent an hour browsing the exhibits here, but the queue moved far faster than that. We snapped many photos while in the queue for later examination - we might come up with some "treasure" to share with Captain Jack Skatt. We also enjoyed the ride quite a bit. Neither of us are extreme coaster fans, so it was reassuring to see that the ride vehicles did not require shoulder restraints (lap restraints were secure and robust, though, and there were cushioned headrests). We settled into our seats, and before we knew it, we were off on our journey towards Everest. After a short trip up the first lift hill and through the foothills, our train started climbing the main lift hill to the mountain top, passing through a hilltop monastery along the way. Reaching the mountain's peak, our train rolled forward through a series of short bends and hills. We coasted up one short hill and our train came to a stop on the slope. Something had torn up the tracks ahead! A buzzard soared ominously nearby. The train rolled backwards into the mountain's dark interior, swooping through unpredictable twists and turns, until we came to a stop in a dimly-lit cavern. Silhouetted in the cave's mouth we saw a huge, hairy beast, pouncing on a railway trestle and roaring as he tore the track to bits. Our train started forward again, dashing at high speed to escape the danger. In, out and around the mountain we went, in a series of moderate drops and tightly-banked curves until, reentering the mountain, we came "this" close to the towering, hairy Yeti "in the flesh" (or fur, as the case may be). The huge, Audio-Animatronic creature leapt right at us, and we were lucky to escape to tell the tale! Whew! This is definitely Disney's greatest "mountain" yet. 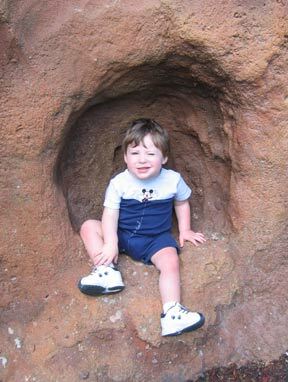 Imagineers have borrowed elements from the many classics that proceeded it, including the rugged scenery and "broken" track of Big Thunder Mountain, the close encounter with a huge, Animatronic beast from Dinosaur, the (far smaller) Yeti/Abominable Snowman from Disneyland's Matterhorn, and the speed and turns of Rock 'n' Roller Coaster. Everest, however, "plusses" every one of those elements to the max - no half-way measures here! Still, while the dramatic story pulled no punches, neither of us felt the coaster was quite as extreme as expected (although Dave was a bit woozy at ride's end). Even Jennifer, who is not a roller coaster fan, will ride it again. However, one ride was enough for us for one day, and we soon parted company with our friends and headed back to our "home," just minutes away. Dinner this evening was at Wilderness Lodge's Artist Point and was as delicious as always. Thursday: Now that we'd gotten a taste of a Disney park, we decided to visit Magic Kingdom for a few hours for Alexander's benefit. 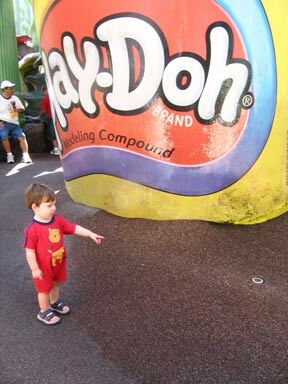 He met Mickey Mouse in person in Mickey's Toontown Fair (amazingly short queue! ), played in Toon Park and Pooh's Playful Spot, bounced along in The Many Adventures of Winnie the Pooh, whirled about on Cinderella's Golden Carousel, and flew high on the Magic Carpets of Aladdin. 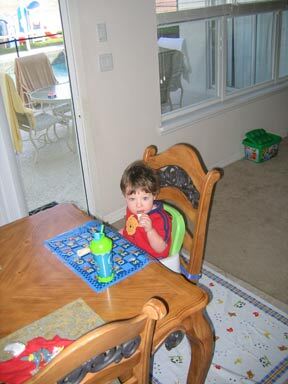 He loved each one and, if he could communicate better, we're sure he'd recommend each to his fellow toddlers. During our Magic Kingdom outing, we also had the pleasure of meeting radio talk show host Rusty Humphries and his wife - they'd read our newsletter that morning and learned we were in town. We enjoyed milkshakes together at The Plaza Restaurant and Rusty invited us to appear on his radio show when our new books come out! 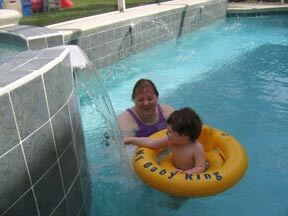 After our play date in the Magic Kingdom, we returned to our vacation home for a refreshing dip in the pool. 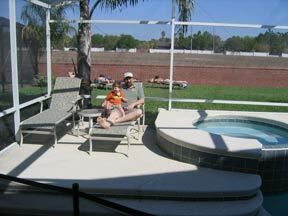 We swam in the pool and/or relaxed in the hot tub daily -- it was definitely one of the highlights of our trip. 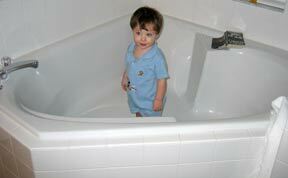 Jennifer also adored the huge "garden" tub in the master bathroom (Alexander liked it, too). Friday: Today began with some high-tech TV watching in the movie theater, followed by a game of skeeball in the game room. Then we were off to Disney-MGM Studios for some playtime at Honey, I Shrunk the Kids Movie Set Adventure. Dave just had to play a round of Who Wants To Be a Millionaire. He got up onto the top ten board several times, but no Hot Seat. 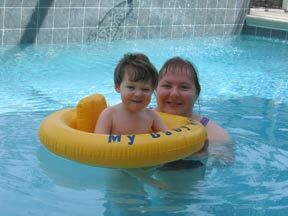 Then it was back to the vacation home for another dip in the delightful pool and a nap for Alexander. Our last dinner of the week was at Narcoosee's at the Grand Floridian, which delivered another delightful meal and a lovely view of the Wishes fireworks.